CEO Steve Rusckowski sought to break down the silos preventing Quest’s business and functional leaders from seeing the organization’s big picture. He sought to provide world-class leadership development while aligning his top leaders around Quest’s newly formed vision, goals and strategy, creating a boundary-less organization that could carry the vision forward. That five-point strategy: restore growth, drive operational excellence, simplify the organization, refocus on diagnostic information services, and deliver disciplined capital deployment. Rusckowski initiated the call for LeadingQuest Academy in late 2014. Jeff Shuman, senior vice president and chief human resources officer, tapped Dr. Tovah Stroud to take responsibility for LQA and turn it into the cornerstone of a comprehensive organizational effectiveness strategy. Stroud, in her new role as executive director of organizational effectiveness, brought in Cuozzo Enterprises to create a conceptional framework. Dr. Pete Cuozzo then reached out to TRI Corporation to execute a 360 assessment and a business simulation as the core of a five-day residential program. Those five days, in turn, would anchor an 18-month program encompassing pre and post assessments and action-learning projects. With an ambitious goal to put all of Quest’s 400+ senior leaders through the program, each LQA hosts 42 to 48 executives. They represent a cross-section of functions primarily from Quest’s U.S. operations. One month prior, participants complete the TRI-Leskin 360 Assessment. Developed by TRI Corporation and Barry Leskin of Talent Management Consulting, the TRI-Leskin 360 is based on 36 behavioral skills that have been refined into 12 elements reflecting business acumen and leadership/people skills. It pinpoints an individual’s strengths and development needs relating to a set of core competencies. 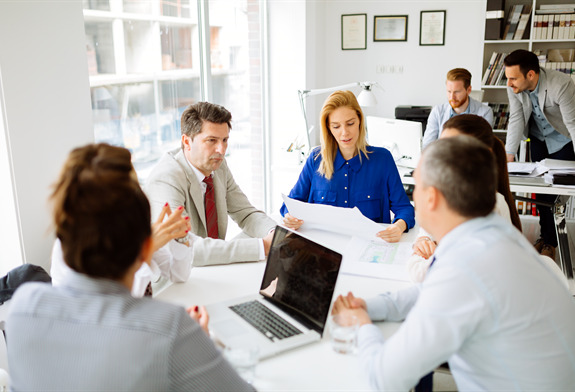 In addition to a self-assessment, each participant is rated by their manager(s), direct reports, peers and customers, providing them valuable feedback from a range of key stakeholders. Upon arriving at LQA, participants are introduced to the action learning projects they will pursue upon their return home. The business simulation begins on day two using TRI’s Leading the Business course. Live role play and vignettes are tailored to Quest’s real-world challenges. Participants are grouped into cross-functional teams of six or seven players, each tasked with transforming a failing healthcare business over six quarters. Teams must learn to make decisions under time pressure with scarce resources, limited information, and divergent opinions. They have their first operations review after two rounds and a second at the end of the simulation. Throughout the program, Rusckowski and senior executives lead interactive sessions that target key workplace skills. There are live customer visits with Q&A and one-on-one coaching sessions to review participants’ 360 results and design a customized 12-month development plan. Every LQA cohort is sponsored by a Quest Senior Management Team member. This gives participants direct access to one of Quest’s most senior executives and exposes the executive to the company’s most promising potential leaders. After the residential program ends, related activities continue. Participants share insights and action plans with their managers; likewise, their direct reports offer reflections to help them craft development plans. Action learning projects continue for six months. After 15-18 months, a second TRI-Leskin 360 and follow-up coaching session measure their growth and adherence to their development plan. Selected by Quest’s CEO and C-Suite, each team-based action learning project is customized to a specific Quest need and has a corporate sponsor. Projects are directly linked to the Quest Management System’s seven foundational practices and participants are expected to use a variety of statistical tools. Project handoffs are highly defined and participants present outcomes and recommendations to Quest’s SMT. By 2017, more than 300 leaders graduated LQA. The results show significant impact; 360 assessment data, for one, paints an extraordinarily consistent picture of the Quest leadership culture. Quest’s original five-point strategy has been refined to two as the others have been incorporated into daily operations. “Now we are driving leader development deeper in the organization so we can build a high-performance culture based on values and behaviors,” said Rusckowski. Through LQA, Quest leaders have completed 13 strategic, CEO-sponsored action learning projects that have generated tens of millions of dollars of incremental benefit. Quest’s LQA leadership network has grown from the cohort to the corporate-wide level, encompassing all regions, departments and functions. Said Stroud, “For perhaps the first time in our storied history, all Quest leaders are fully aligned around a shared vision and laser-focused strategy.